I haven't done my full Pioneer Week wrap-up yet, but I did want to mention one thing that has come out of it. My habit for hanging laundry has been re-established and, since I'm not using an exclusive outdoor rack or laundry line, I can move the whole thing in willy-nilly depending on our rainy Seattle weather. The other fun thing is that I can move it around the yard to chase the sun for maximum drying action. Ever since we had to get rid of the laundry line in our backyard and I moved the indoor laundry line, I haven't been able to do a full load air-dried and it's been driving me a little crazy. It's been a year since I've been able to line dry clothes. What am I using? A folding steel indoor/outdoor drying rack that, by it's lonesome, will hold an entire huge load of laundry from our GE Neptune HE front-loading washer. That's 25 linear feet. In any case, I'm (re)hooked. I don't care how long it takes to hang the laundry since I get a huge thrill out of the energy savings. I'm planning on getting a second rack so that when I'm exclusively drying clothes inside (which will be shortly given the fact that we are already having rainy fall weather in August), I can hang two loads so that it has ample time to dry. My visiting brother-in-law, who thinks I'm certifiably mad, asked me, as we were sitting out in the backyard last week and looking at the rack, how much energy I used in ironing the clothes to get rid of the wrinkles. Since we don't mind wearing wrinkly stuff and, more importantly, most of the clothes we have are wash and wear, the energy use is non-existent. I still do a little short fluff dry on some clothes to finish drying and remove wrinkles, but the energy costs are arbitrary. Anyway, what about you? What's your excuse for not line drying your clothes? I have only flimsy excuses. I hadn't been line drying my clothes because when I was working FT I did all my laundry on one weekend day and there wasn't enough space or time to dry all of the clothes. The one spot where I used to have a clothesline outside when I first married is now in the shade as the tree is much bigger now. I have a line in the basement, but it's damp there so it takes soooo long for the clothes to dry. I do bring some items, like delicates and sweaters, upstairs and dry on a rack. Now that I'm not working and can spread out my laundry throughout the week, I'd like to try air drying clothes. I'll need a new rack as mine is too small to do a significant load of clothes. How do you hang your clothes on the rack? Drape them over the rods in half or hang with clothespins? 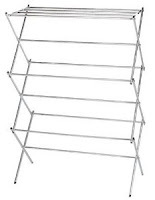 Do the clothes hanging near the center dry as fast as the clothes towards the outside of the rack? Do you dry towels and stuff on it, too, or is it too small for that? Paula - I just drape the clothes on the rods. If it's really windy and the items are light they can blow off but that hasn't really been an issue. For larger things like jeans and towels: outside, I've been white-trash draping them across our patio chairs. Inside I hang them from hangers, although you could use the rack. I didn't have the space in my old apartment, and in my new one, I haven't done laundry yet! I have a retractable clothesline set up in my bedroom! It's glorious. Though I can only hang one load at a time, so I've been looking for additions to my indoor air drying setup and your portable rack thing is looking good. For now, I end up using doors and chairs for any overflow. Luckily, we don't have visitors often. My excuse for not air drying my towels and socks is that I'm disabled. Hah! Best excuse EVER! I have an Ikea Frost rack that I really like. It takes up more room when it's in use, but it spreads the clothing over more area than a lot of racks I've had. It also lets me swing the side racks upward instead of horizontal. The last time I was in I saw the Antonius tall folding (41 yards with a 29" square footprint) rack, which is adds space vertically. I also use the shower curtain rods for clothes on hangers or bigger items. I picked up extra pressure mounted shower curtain rods second hand. I can them in the tub at different heights if I need extra space for long pants or towels. While not about the "line" itself, most of our bath and kitchen towels are cheap, thin towels. They dry faster in day to day use, which helps prevent mustiness, and dry faster on the line when they're washed. Finally, I have a silly laundry squid from Ikea (Pressa). It's got 16 clips on it's arms. I use it for socks and washcloths. I really want something similar in metal, as this has been surprisingly useful. I can hang it up in all sorts of odd places. It's also very easy to grab in if rain comes quickly. I hang socks in pairs on the clips by clipping between the insides. I live in England, where it is still the norm to hang out your washing, at least some of the time. We're unusual in that we don't own a tumble dryer though. These are common here. I'd prefer a long line, but this fits better in our garden. We also have a couple of different airers (hangers) in case the weathers looking threatening (it is England), or to use inside over the winter. Sheets etc hang over doors, some things go over radiators (I have a little camping airer that fits onto a radiator too) and we have an airer by the boiler to use some of that heat. There are also A frame airers that stand over a bath. I've had 3 children in cloth nappies (only ever 2 at any one time) and have a child who is fairly frequently wet at night; it's just establishing the habit, I think. We don't do a massive wash just before people visit and friends don't mind the odd sheet drying, but laundry can be whisked up stairs if necessary. The evaporating water saves specifically humidifying the atmosphere :-) (We have oil-fired radiators and a wood burner). I iron very little too. I used to iron a lot more, but realised all the children's beautifully ironed clothes were screwed up in the corner of a drawer where they were looking for a particular item, and stopped! Jeans, tshirts etc may look a bit creased to start with, but they drop out as soon as they're worn. I also shake clothes out well before drying, and make sure I hang things flat and then fold them off the line to take them indoors. It is still the norm to hang out your washing in Australia too although most people seem to have a clothes drier as well. Mine died four years ago and hasn't been replaced. When the weather doesn't allow outdoor line drying I use a couple of fold up wooden clothes drying racks which get moved from room to room to find the warmest spot. I find I only iron my husband's cotton business shirts now and can't believe how much time I used to spend ironing. We have a nice big (nearly 200 running feet) clothesline that gets full sun from 10:00 am on. It's fascinating how few of our friends have ever used a clothesline, though, so they are always quick to tell us all the reasons that what we have been doing doesn't work (clothes won't dry, scratchy towels, bird doo, etc.). Drying clothes on a clothesline is like socialized medicine: once you've actually experienced it, you won't want to give it up. I line dry most of our stuff outside in the summer, unless the weather is bad. Lucky to have ample hanging space in basement so I do a lot of line drying in the winter; the humidity is very welcome then - in the summer, not so much. Does anyone know if it's ok to hang out laundry when there's an ozone alert? Obviously that would be more environmentally sound, but does it pollute the clothes? I'm in the UK and currently have two loads of washing hanging on a line that goes the length of our garden and back again. I also have three airers of different sizes I can use in the house if I need to. In the winter I mainly use those and hang things on the radiators when the heating is on. I rarely iron anything. My mum has a ceiling airer in her kitchen, which she can raise and lower with a pulley - I'd love one of those, but my ceiling isn't high enough. I line dry a good deal of my laundry in my basement all year round. we were blessed that the previous owners of our house thought of this because I don't know that it would have been that ovious to me or that my husband would have gotten around to doing it;) I just hang the shirts on coat hangers that I save from clothing purchases, always ask to keep the ones that come with your pants, they come in handy when hanging them to dry. I can get several loads on just two lines strung across my laundry room. I also had my husband drill holes the size of the coat hangers we use in the frame of our metal awning on our back porch so that I can hang the clothes from that in the nice weather. I would like to get one of those racks you have because that would alleviate drying underwear and socks, and towels in the dryer or reduce it anyway. Thanks for posting! I have a rack similar to yours (only it's incredibly flimsy and I'd like to replace it). What I really prefer is to dry things in the dryer for a short time, then hang them up to finish drying- this seems to eliminate the crunchiness. But they just raised the price of the dryer in the apartment building, so I'm trying to use it even less now. I really do need to get a second rack b/c the fact that I can only hang up one load at a time deters me from line drying sometimes. Oh, I forgot to say- I lived in a house for a few months where there was a washer but no dryer, only a clothesline. This was in So. California- some of my clothes got faded to the point of being ruined from hanging in the sun. I guess I probably left them out there too long, but who has time to sit around and make sure their clothes come inside the second they're dry? This link shows what we built in our basement for line-drying in any weather--takes up very little room and holds two loads. I got the idea from Heather at the Simple Green Frugal co-op blog and the link to that is on my blog post. I line dry everything except bath towels and socks. I have an indoor, five line, retractable clothesline that I love. I can hang two full loads on it as well. I don't have a yard of my own in my apartment, but the basement had lines up on day one. I usually dry my clothes on these lines and my delicates on a rack in my bedroom (it is a shared basement, so I'm not trying to share too much!). I do still dry linens and such in the dryer. I suppose I could line dry my sheets but the quilt and the blankets I use for animal bedding are more difficult. I have guinea pigs and their bedding is a great fleece blanket, which is much more economical and eco-friendly than litter. They live in about a 10 square foot cage so I greatly prefer keeping things simple. Still, it would be nice to hang dry the blanket. Maybe I could try partway drying it and hanging it for the rest of the way. Unfortunately, my current apartment is so small we have very little area to hang things up, but in the house that I used to live in there was an overhang that we could line dry our close under in all but the most stormy of weather. We had no dryer there, because the very old wiring in the house didn't allow for it. I would like to do something similar when we move from here. I live in a rural area on Canada's east coast. We have always line dried our laundry - there is virtually always a breeze so ironing is never needed: the clothes blow dry wrinkle free. In winter, we just hang indoors to humidify our very dry winter air. Putting them over a furnace vent or beside the woodstove dries them quickly. Holy cow I am jealous of your metal drying rack. My mother had one of the ones made of balsa wood (or something equally flimsy) that would collapse if you looked at it, and broke in three places before she got rid of it. ozone won't hurt your clothes - it's actually one of the things that "green cleaners" use to clean clothes. I'm getting to the time of year when it will start taking things 2-4 days to get dry on my 3-season-porch laundry line - the temps go down but the humidity stays up. I end up using the electric dryer for 1-2 loads a month then. Right now though it's 90 degrees and my laundry is doing fine on the line. We air dry about one-third of our laundry. We live in a small townhome and, instead of a personal washer and dryer, we have a community laundry mat at the other end of the complex. Because of this, we do all of our laundry at once, about every two weeks or more. We probably average nine loads on laundry day and air dry about three of those. Honestly, I line dry what I do because it can't be dried in the old, super hot dryers that we have. I actually really enjoy the process of line-drying, though. Because I air-dry three loads at once, the house is taken over by drying clothes. Mostly, I use the spare bedroom. I have a collapsible drying rack but I also put shirts on hangers and hang them from the ironing board and door frames, and drape pants across chairs. When the West Texas wind isn't blowing sand and dirt, I dry clothes on the patio, using the drying rack, chairs, and the trees. If I had my own washer and could do a little bit of laundry more often, I would probably air dry almost everything. We hang dry laundry outside on the line or the clothes racks, but when it turns back to grey 'round here (read: 49 degrees, overcast, 51% chance of drizzle), things don't dry outside, and we don't have heat on inside, so they don't dry there either. That's when we use the dryer most. I've been known to hang stuff out when it's sunny and cold, with snow on the ground (but low humidity and 0% chance of precipitation). I've found that if you really straighten out clothes before hanging them, you don't NEED to iron - especially jeans - they dry all flat and wrinkle-less, whereas in the dryer, they come out with their legs all bound up from tumblin' round. To avoid fading, turn the clothes inside out. Also, if you straighten and carefully pin the clothes to the racks, you seldom need to iron. I don't line dry my kitchen linens because I don't have enough rack space for all the wide napkins. Also, I prefer not to have dog fur on them. No excuses. Just don't do it here in the rainy NW. Well not often, When I wad young and broke, I use to wash clothes in a tub full of water, and hang the clothers from a similar drying rack as you have, but then I got older and started to save some money and bought a washer/dryer. I have no excuse--I live in Albuquerque! We intentionally did not install a dryer so I get to line-dry my clothes all the time. I get a little giddy at the energy savings, too. I have a line inside that my hubby built, modeled after some we saw online. You can fold it against the wall when not in use!! It's great, although our downstairs smells REALLY musty when I use it. (I'm in Seattle too.) I probably use it for 50% or our stuff. I've thought about getting a dehumidifier, but think that defeats the purpose. I live in the maritimes. There are certain things combined with certain times of year that I just cannot get dry on the line. (I'm thinking our down duvets) I'll use the line to get them almost there and then throw them in the dryer for a short time. I avoid the need to wash them by using duvet covers but with kids in diapers and who still occasionally wet the bed sometimes I need to wash them more frequently than normal. But pretty well everything gets dried on the line here. Strung back and forth between the house and the barn. If it has to come in damp I tend to put things on hangers and distribute them widely apart in my closet ( I have the luxery of a large walk in closet with a window so it gets lots of light and is airy. My friend asked me how long it should take for her herbs to dry . I said a week for the thickest bits. This summer has been so incredibly humid some of her herbs have been hanging 3 months and still aren't really dry! Ewww, I told her to check them for mildew and next time she can borrow my dehydrator! I'd love a folding dryer like yours, set it up in the kitchen near the woodstove in the evening and things would be bone dry by morning! To this day, the percentage of my clothes in the family wash is generally around 10%. The two kids and dh wear *way* more clothes. Laziness is my, lame, excuse. :/ Although my winter excuse is a little more sturdy. We have to use a dehumidifier in the winter, so I wonder if drying clothes inside is any better than just throwing them in the dryer if we are just having to use the dehumidifier more often? Our apartment is too small to line dry all of oue clothes. I dry the cloth diapers on a rack on the balcony or in the living room (much to my chagrin of my husband because it takes up the whole room) but there's no way I can add a second rack for clothes. We wouldn't have space to walk. The ceiling's too low for a hanging rack and we can't nail anything to the balcony walls. We'd hang ourselves if we tried a retractable clothesline. I wish people designed apartments and thought about where people could dry clothes. My friend who lived in Japan said it was planned into every place she lived and easy to do even in a small space. Our friends in Denmark had a communal laundry room with tons of clotheslines and outdoor clotheslines for the summer. For now I do what I can. I remind myself that 4 people living in an 850 sq. ft. apartment with the heat turned down in the winter saves a lot of energy. We use our dryer more than I want to, but we also save energy in other ways because of our small space. My excuse for not line drying is that I have 5 kids and am pregnant! But, I like to and have in the past. Years ago, I lived in a small, walk up apartment in New Jersey with my husband and baby. We did our laundry in a portable washing machine, hooked up to the kitchen sink. We opted to do one load per evening, (after the dishes), and then hung the items up to dry overnight. (Dryer stand for the cloths; doorways and shower rod for towels and sheets.) Everything usually dried overnight. On the most humid days, we would help the drying with a portable fan. We would fold and put away in the morning. We didn't have space (or the need) for a dryer. Note: now that we live in Seattle, and have a laundry room in our house, I use our dryer for about 1/2 of our laundry. We've been drying everything on racks in the guest bedroom. No line drying outside because of pollen and rain. We used to have a dryer, but it died on us, and before that I didn't use it much anyway. I have 6 kids and we do enough laundry to keep our dryer and our line going. Using both really saves time- and I love the excuse to get outside. Blankets and sheets are my favorite to line dry- my husband prefers his jeans fluff dryed- so I try to time the loads accordingly to where there is space to dry them. And my husband's underclothes smell so good when they dry in the sun. I'd cuddle up to them with or without him in them. Thanks for sharing your tips on drying clothing. Using fabric softener while washing them does seem to keep garments even when put on an outside line. Good post. I've been washing my clothes in cold water. My mother told because i do this I need the hot air of the dryer to kill germs (like say on our unmentionables) and leaving them to dry inside would do this. Does anyone know if this is true? I line dry whenever I can. I actually bought a Hills Hoist and installed in my backyard. I highly recommend it. I also have have 6 lines in my basement. I do dry towels, sock and underwear in the dryer.